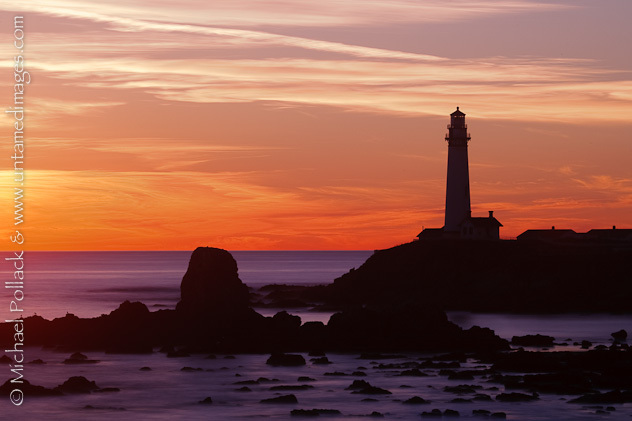 A colorful winter sunset at the Pigeon Point Lighthouse on the San Mateo County coast of California. Today I installed Lightroom 4 on my desktop computer while taking a break from culling safari pictures. I wanted to make sure the the old image catalog converted without errors so I selected a bunch of image folders, one after another, and spot-checked the images to make sure they were where they belonged. That is when I stumbled upon the image shown above. Taken in February of 2011, this photograph of the Pigeon Point Lighthouse was one of my first attempts to employ a 10-stop neutral-density filter. A filter of this type, which looks like a piece of opaque black glass, allows only 0.001% of the available light to pass through the lens. This allows the photographer to employ very slow shutter speeds even when the ambient light is relatively bright. Here I set the shutter speed to 20 seconds which allowed a surreal softening blur of the water, and to a lesser extent, to the clouds. The Gemini Observatory and the Canada–France–Hawaii Telescope glow in the fading light on Mauna Kea's summit. On our recent trip to the Big Island of Hawaii, Alison and I spent our second-to-last evening on the summit of Mauna Kea to watch and photograph the sunset. At nearly 14,000 feet, we were thousands of feet above a blanket of clouds that covered the lower elevations of the island and extended out to sea and across the channel to Maui. At this high elevation whatever plant life exists is well-hidden to elude the harsh conditions, and with the loose volcanic soil all around, it’s easy to imagine yourself transported to another planet. The other-worldly architecture of the observatory buildings only adds to the feeling of being in the middle of some extra-terrestrial landscape. 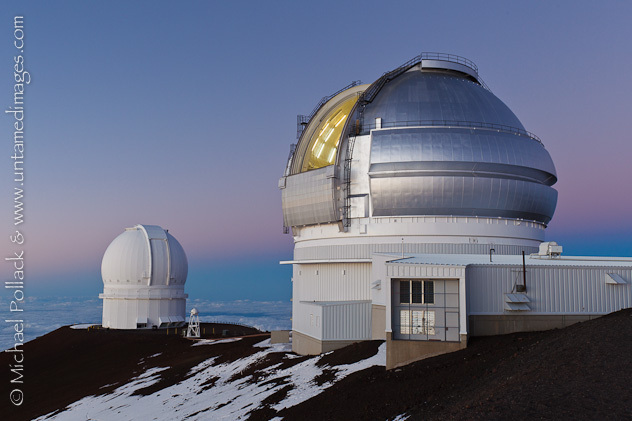 Pictured above are the Gemini Observatory (foreground) and the Canada–France–Hawaii Telescope (background), two of the dozen or so telescopes constructed in this desolate locale to take advantage of the thin atmosphere and typically cloudless skies on Mauna Kea’s summit. Very soon after the sun descended below the horizon, the Gemini’s silver dome began to rotate slowly and the observing slot door retracted, offering us a glimpse of the dome’s interior as shown in posted photograph.